Customer perception that companies care about the services they provide, and customer trust in water companies both remain high. 73% of customers are satisfied with the value for money of their water supply. 76% are satisfied with the value for money of their sewerage service. The overall 5 year trend is stable in 2016. 63% of customers agree that the charges they pay are fair. 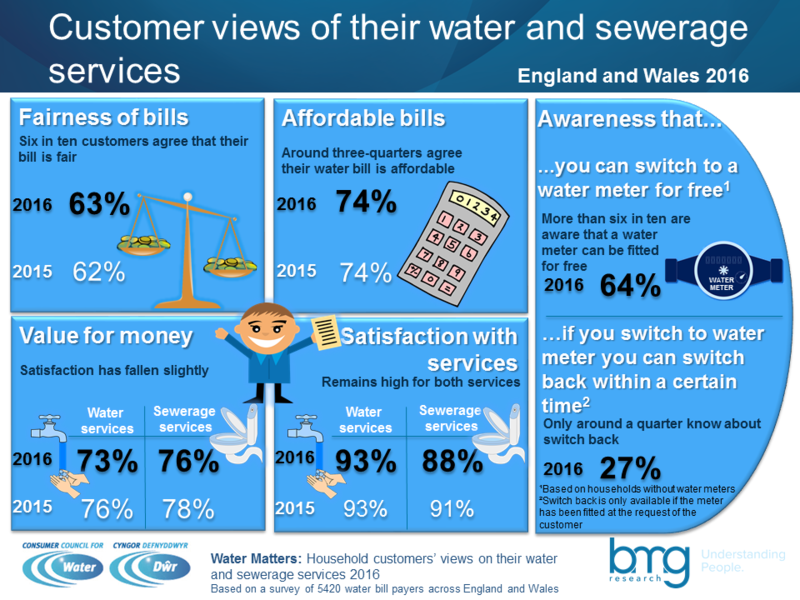 74% agree that the water/sewerage charges they pay are affordable. Perceptions of affordability have improved significantly across England and Wales over the past 5 years. 93% of customers are satisfied with their water supply services. 88% of customers are satisfied with their sewerage service. Awareness that water meters can be trialled for up to 2 years has fallen significantly in the past 5 years. You can also see how water companies are performing. If you have any questions related to this research, please contact Steve Grebby, Policy Manager at steve.grebby@ccwater.org.uk.